Readers, you know that my blog tends to be whatever is hanging out on my desktop or in my head. I am very interested in teaching, learning, languages, cultures, literacies, stories, and people: Mostly people–for example, Kelly. 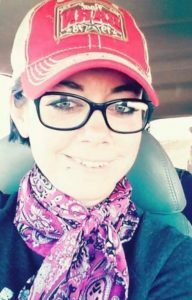 I am fascinated by the lives of modern young women who live on isolated ranches. 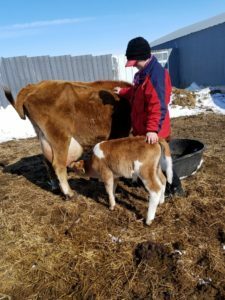 In this issue of WinkWorld, I will tell you a little about one young woman, Kelly, whose life is reflective in many ways of how other young rancher women live. They seem to live in 2 different worlds or 2 different centuries. I see that some of their challenges are not too different from those of my Grandma Grace, who homesteaded this ranch where we live. And, other times, I see these young women on social media on their phones, and I am amazed at their skills. I remember several years ago, when Kelly’s clothes dryer stopped working. She had small children playing outside in the dirt, a husband whose clothes were often covered with dirt, manure, and wheat shaft, and there was no one around who could help her. So, she jumped on YouTube and figured out what the problem was and learned how to fix it. Soon, her dryer was whirling again. I know many people solve problems this way today, but Kelly was the first person I saw do it. Now, I am convinced that she can, and often does, learn any skill needed by getting on the internet. For example, recently I know she learned how to make butter with cow’s milk and how to give an IV to a sick cow by watching YouTube. On the surface, this might appear to be a blog post only for prairie people, but I think this story is really for my friends, who live in cities, and have no idea about country life. 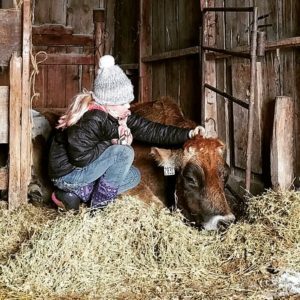 Many in cities have romanticized, nostalgic notions of life on a ranch, which have nothing to do with the reality of some of these young rancher women. 1 pony, Apple, 19 years old; 8 goats Richard, Mavis, Sheila, White Momma, Black Momma, and Luna + 2 baby goats without names; 3 dogs, Gus, Bruce, Bodie; 3 cats, Henry’s Cat, Kinley’s Cat, and Casper; 12 chickens; 5 ducks (one duck only has one eye, because the other peck her, so she lives with the pigs); 2 potbelly pigs, Frank and Daddy; 1 nurse cow, Janice (who presently has 2 bum calves on her), plus she is pregnant; and 80 pregnant cows. 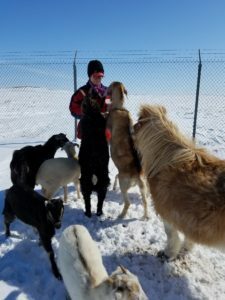 Kelly, Jesse (her husband), and their 5 kids spend many hours each day just feeding and caring for the various animals. Their kids think that mom has her very own petting zoo. 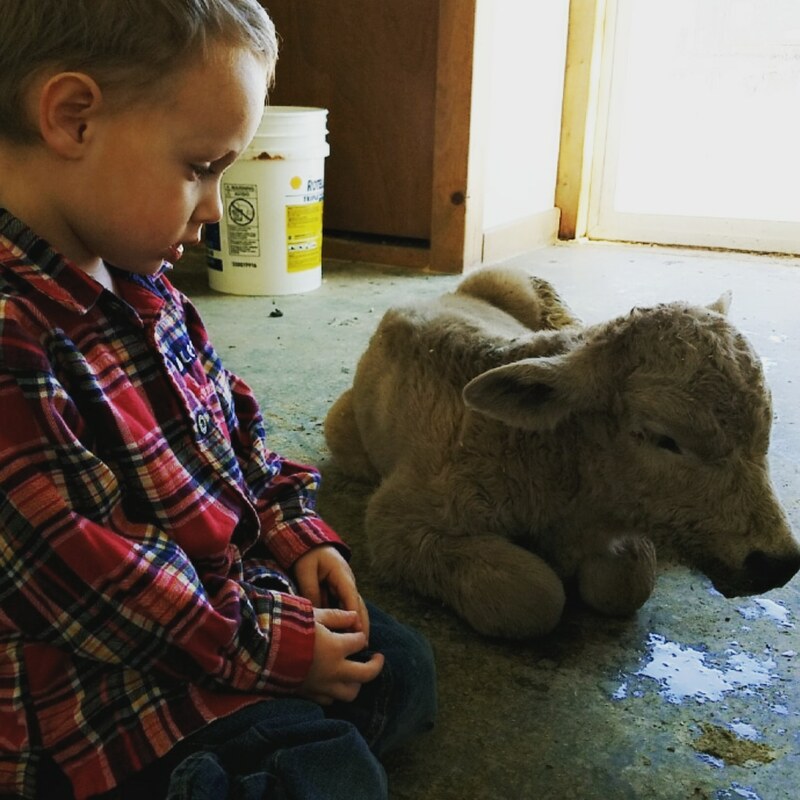 Meet Henry spending quality time with one of his pets. 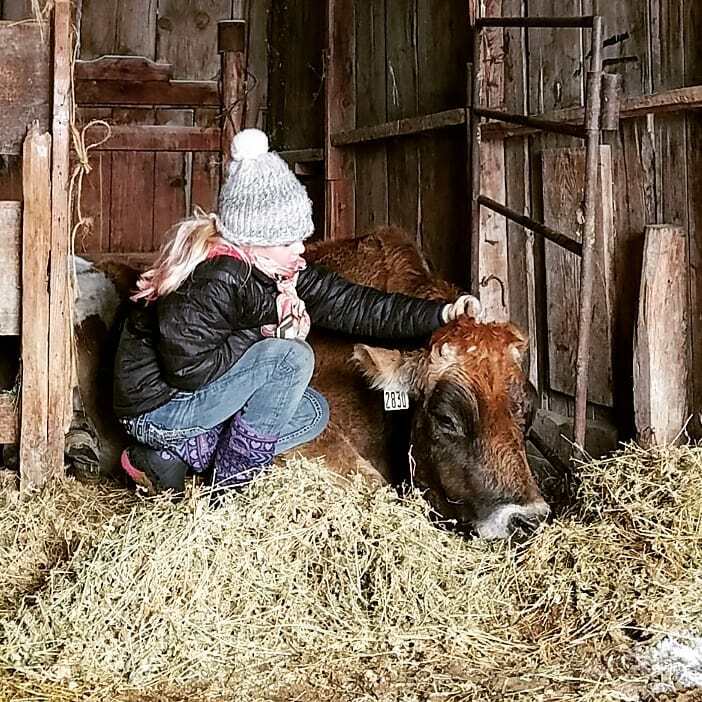 Kimber is soothing the mama milk cow, Carol. Sadly, Carol died later of milk fever. Here is Kelly with Janice, obviously another nurse cow who accepts the bums. 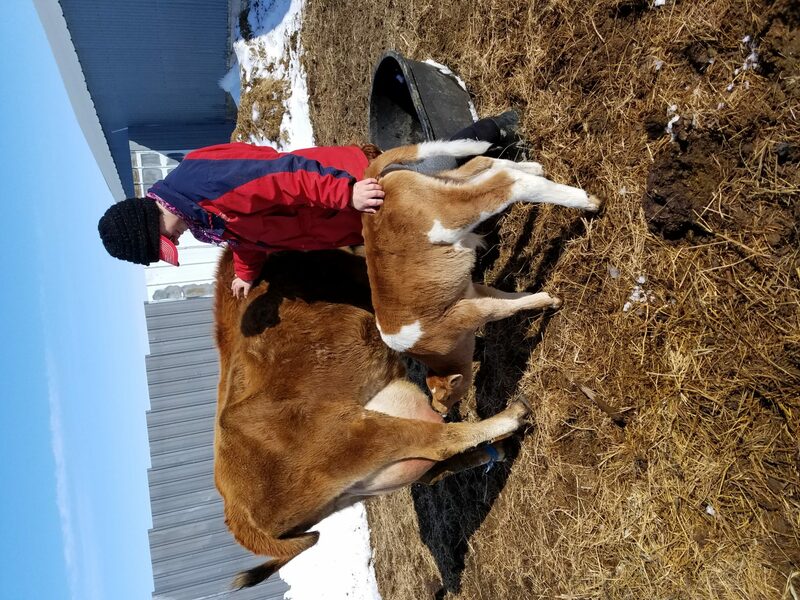 Bum calves are those whose mama did not make it through birthing in a blizzard. 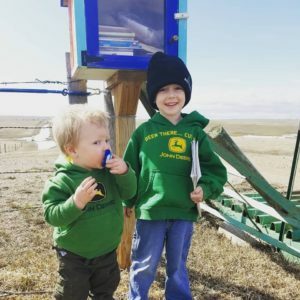 Recently, I noticed that Kelly and her two little boys had stopped at our Little Free Library. Incidentally, their ranch is 40 miles from ours. This is considered all part of the community on the rural prairies. 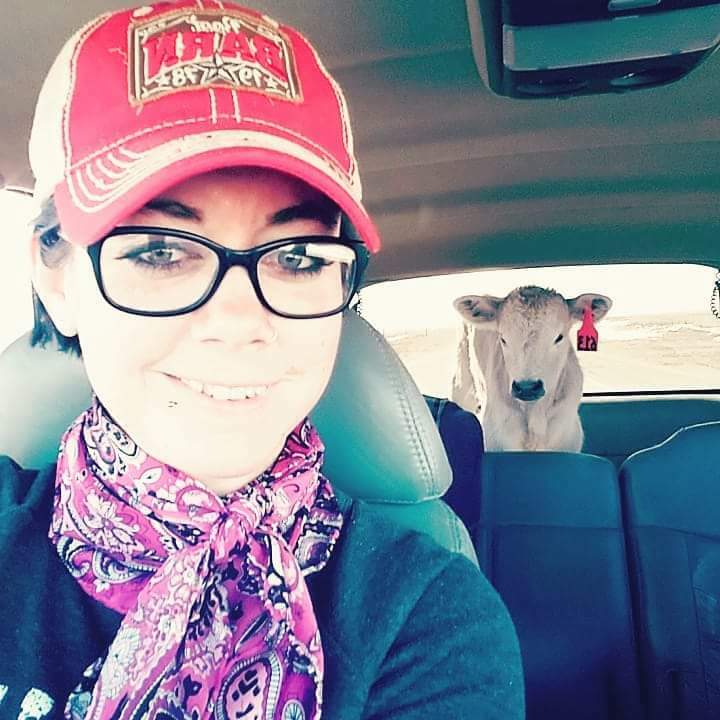 She had to hurry home as she had a calf, who had lost its mama, in the back seat of her Blazer. Below, you will see Kelly with a calf in her car. When a mama cow loses her baby, Kelly jumps in her car and drives 100 miles (one way) to pick up a calf, who has lost its mama in birth. Kelly takes the new little bum calf home and skins the hide from the dead calf, and ties it on the new calf. By doing this, the mama cow thinks the new calf is really the calf which she birthed and will then accept the new calf. Without that smelly hide, the mama cow would reject a new calf. 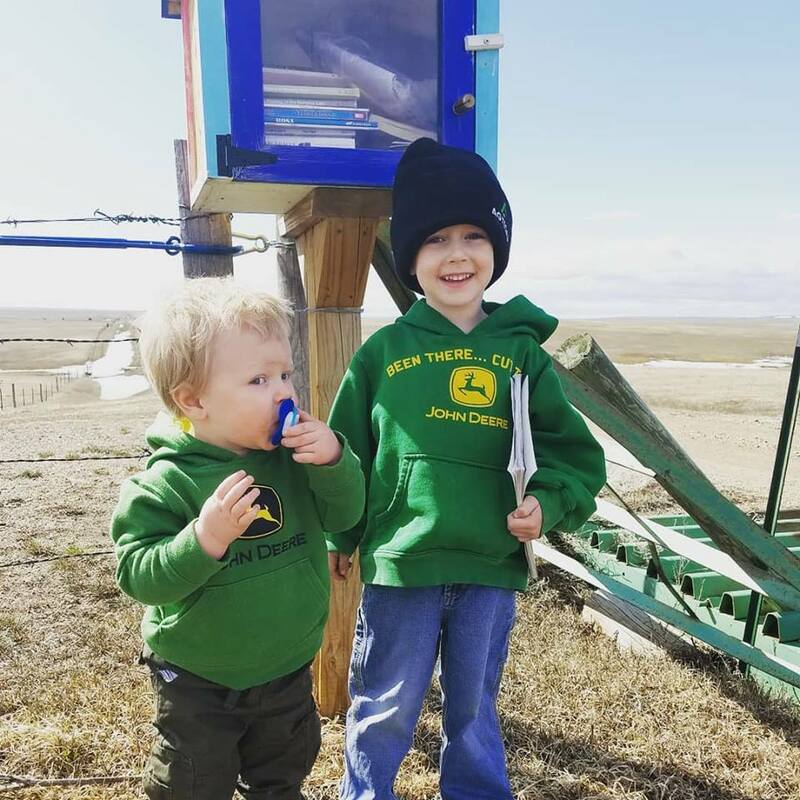 Henry and Holden at our Little Free Library (LFL). 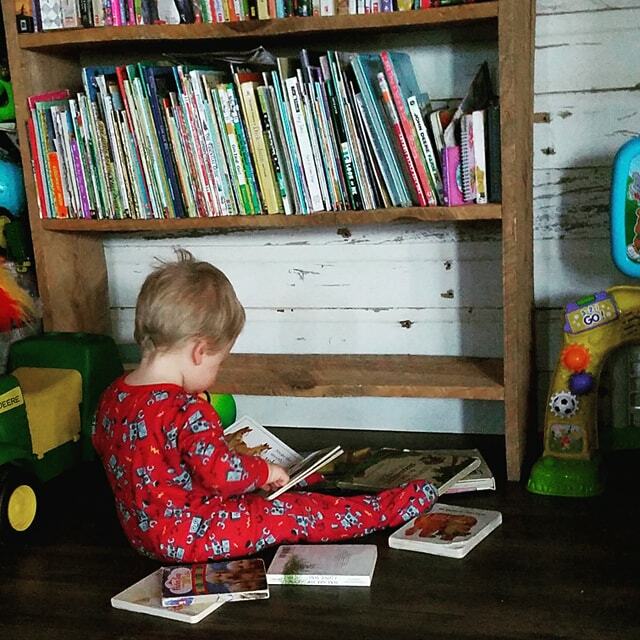 Here is Holden reading later that evening. 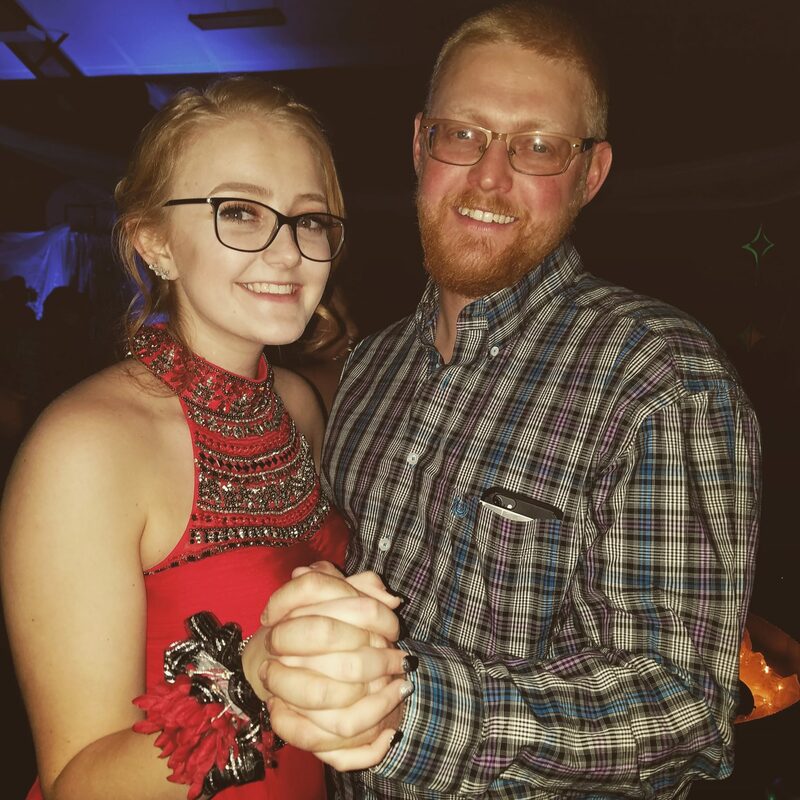 Here is Kelly oldest daughter, Kodi, dancing at the spring prom with her dad, Jesse, for the father/daughter dance. 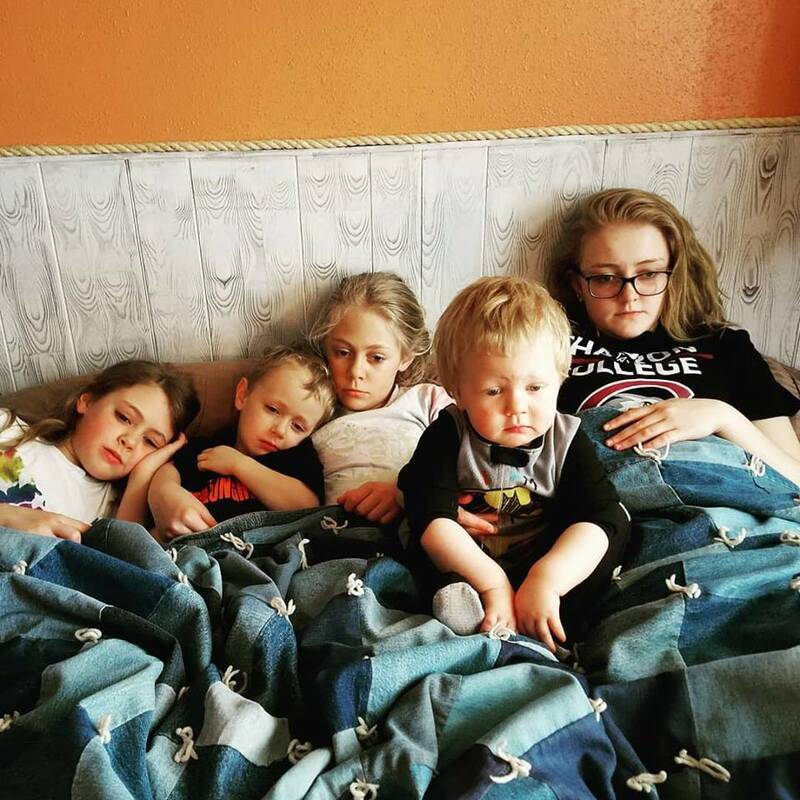 Here are all 5 kids watching a movie. 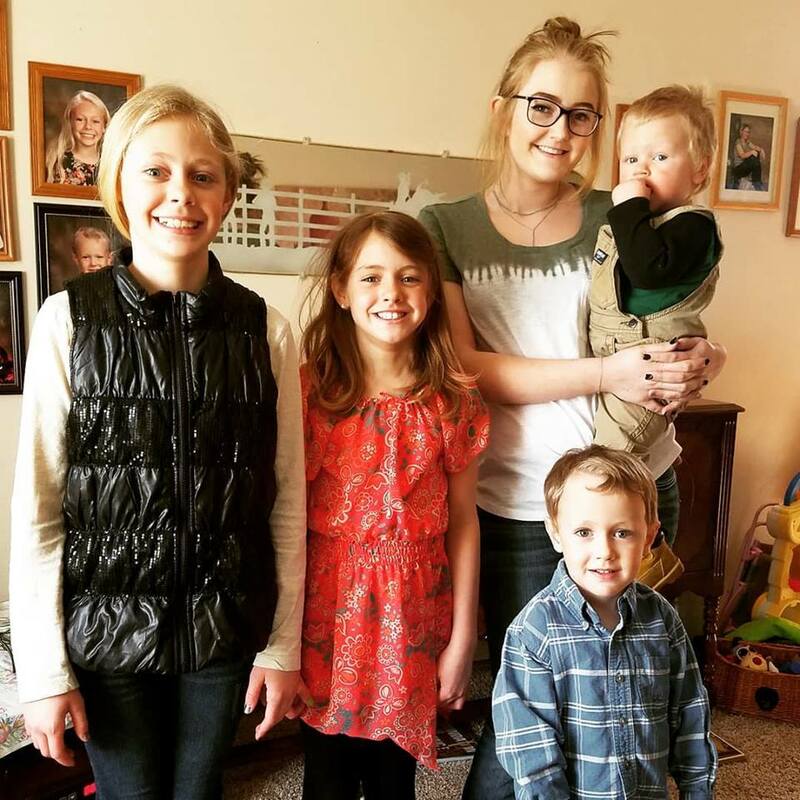 Kelly loves her family, and when I read the following study about the benefits of hugging babies, I thought immediately of her. Based on this study, and what I have seen, it is safe to guess that Kelly’s kids are very smart. Of course, the real story of Kelly is not what I am writing, but rather what I am not writing. Her real story is hidden between my lines. Maybe one day, she will tell her own story. If we don’t tell our stories, they die. I love this story. Kelly is amazing and you described her life and ingenuity so well. I want to know more about her. I hope you can convince her to write her story. I’m so glad that this story works for you, too, Connie. I am crazy about Kelly – she has over-come many obstacles. Very impressive woman. You would love her more if I told more, or if I can get her to tell her own story. I remember the Keegan family well. Of course, we know and love many of the same people. Where do you live now? We live in Rapid City now and from ties on the ranch I love gardening and flowers are my favorite, esp perennials. I love to go back to the country where we can see the complete horizon. Love the sunrise and sunset and how nature warms the heart. I do not really remember the Wink name do believe Richardson’s lived where the Wink sign is now? 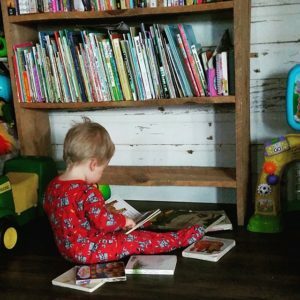 Love talking with those from “back home” and plan on reading some of your books? Any other of your writings I may enjoy? You have a blog? Am not very familiar with blogging. Again enjoyed the story on Kelly. Kelly is amazing and an inspiration. My Mom Verna Steen cared for your Gramma Grace and I loved to listen to her stories when she chose to share. I remember Verna. Thanks for reaching out. Where do you live? I think you might like to read “Meadowlark,” written by our daughter, Dawn Wink. it is based on the stories Dawn remembers me telling about Grandma Grace. Thanks, Dr. Whitehead van Loben Sels: World’s Best Last Name!